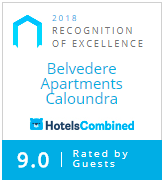 Experience the perfect relaxing break at Belvedere Holiday Apartments, Golden Beach on the Sunshine Coast, Queensland, Australia. Only one hours drive north of Brisbane, 30 minutes drive from a major airport and 45 minutes drive south of Noosa, Golden Beach is ideally situated at the southern entrance to the Sunshine Coast. Only 5 minutes away from the Greg Norman designed Pelican Waters Golf Course. Our one, two and three bedroom Golden Beach holiday apartments are perfectly suited for families, couples or a group of friends. With the beach literally across the road and all the attractions the Sunshine Coast has to offer within easy driving distance. Take in the panoramic waterviews, fire up the BBQ or just laze by the pool. A myriad of restaurants, coffee shops, doctors facilities, pharmacy and supermarket and specialty shops are a 250 meter stroll away. Only one hours drive north of Brisbane, 30 minutes drive from a major airport and 45 minutes drive south of Noosa, Golden Beach is ideally situated at the southern entrance to the Sunshine Coast. "“Very impressed!” - We managed to get a really good deal on our three night stay for 4 people and in spite of a good TripAdvisor rating we were still surprised to see how spacious the apartment was. We were upgraded to a three bedroom unit (no 6) which had been decorated in beautiful beachy colours, the large balcony with outdoor couch and chairs as well as a large dining setting was a perfect place to relax. Lock up parking was very welcome and the managers were friendly and helpful, thanks Yvonne we look forward to coming back. “Well appointed, spacious apartment” - We had a 9 night stay and was So impressed with the overall presentation. This is our second stay here and will definitely be a yearly occurrence.Fab view from the big deck, looking over to Caloundra and close to some great eateries and stroll along the beach front. We love it here! “Fishing/Relaxation H.Q." - We've stayed in several different rooms over the last few years and found them all to be roomy, comfortable, clean and importantly affordable.Great views from the large balconies on top 3 floors. If you're down lower you can walk across the street and you're on the beach for the same view. The staff are friendly and approachable and go the extra mile if you have any special requests or need help or information regarding the local area. 2 minute walk up to Golden Beach shopping precinct with cafes, restaurants, hair dressers, news agents,etc..,etc..
“Lovely” - We have stayed here numerous times over the past four years and have always found it relaxing, comfortable and very clean. Great position, with large balconies, in a location perfect for families. Very helpful managers. Secure car parking in a location where we just park the car on arrival, walk to everything we need, and then load up the car when we leave.